Since its origin, Apple has been instrumental in helping higher education institutions provide the right resources to faculty and students. 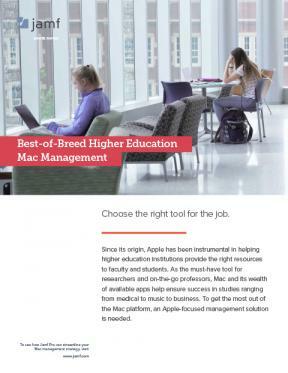 As the must-have tool for researchers and on-the-go professors, Mac and its wealth of available apps help ensure success in studies ranging from medical to music to business. To get the most out of the Mac platform, an Apple-focused management solution is needed. Enterprise and K-12 education versions also available.